$6 Billion for a Nuke-Building Shed? American taxpayers are getting fleeced for a New Mexico bomb facility we don’t need. As the president prepares to unveil his federal budget plan next week, it’s a good time to remember that there are boondoggles, and then there are boondoggles. Under the latter, see the multi-billion-dollar “Chemical and Metallurgy Research Replacement-Nuclear Facility,” a single unfinished building in a New Mexico nuclear complex whose cost has ballooned since its approval a decade ago, and whose main purpose is to build stuff we don’t need: plutonium components for new atomic bombs. What does that buy America? 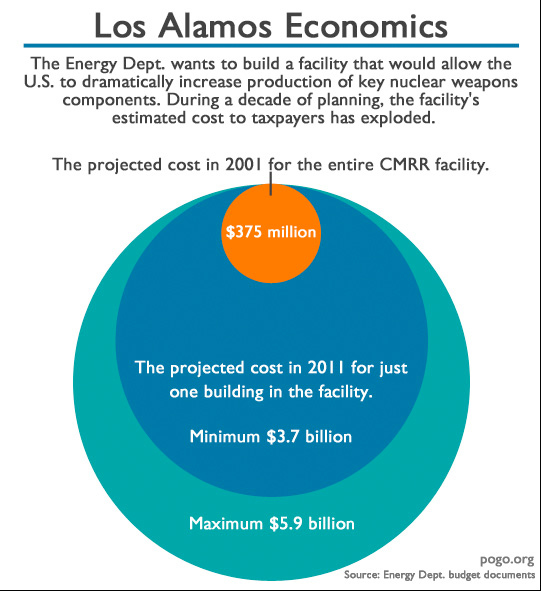 According to a 2008 congressional report, the facility and its surrounding complex have “no coherent mission to justify it unless the decision is made to begin an aggressive new nuclear warhead design and pit production mission at Los Alamos National Laboratory.” In other words, its purpose is to build new nukes—and at a time when we’re supposed to be cutting our nuclear arsenal, not expanding it. Proponents of the facility and its incomplete structure say that even if no new nukes are ordered, the facility will be used to keep our current arsenal safe. “The primary mission of CMRR will be to support the current nuclear weapons stockpile through surveillance and life-extension programs necessary for the nuclear weapons complex,” the Los Alamos memo states. But there’s a problem: Los Alamos is staying mum on the opening date for the complex. And the Project on Government Oversight estimates it won’t be operational until at least 2023—by which time all of the US military’s existing weapons will have gone through already-scheduled “life extension” upgrades. The CMRR nuclear facility will indeed be a building without a mission, all for roughly 12 times the amount of money President Obama is begging Congress to spend on Alzheimer’s research next year. Somebody set up us the bomb!